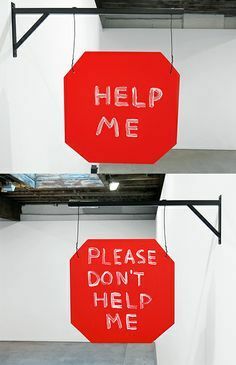 Sculpture by David Shrigley, contrasting the two reactions to help. Help is a notion that many of us take for granted. You ask for help when you cannot do something yourself. But is help always a good thing? What is its relationship to identity, agency and power? My first field visit was to rural Sindh for a LANSA study on women’s work and nutrition. Our purpose was to share the information about undernutrition in women and children with the communities it was collected from (during an earlier round of the survey last year) in a discussion-group setting we call “community circles”. Most of the groups of women and men responded positively to this information, agreeing with it, and coming up with reasons why they thought the women and children in their communities were weak and undernourished. The second part of this endeavour was to allow those same community members the space to come up with solutions to their problems, and this is where many of them got stuck. Of course, it is hard to come up with solutions to systemic issues in a day. But what was interesting was the reaction of many to the idea of helping themselves. Perhaps this response is a standard one that reflects a lack of resources. Psychological research tells a different story. A large part of the notion of wanting or needing help has to do with how people perceive their identity, agency and power. Wang and Dolido (2011) conducted a study on disabled university students and measured their levels of autonomy (associated with lower help-seeking) after priming half with their disabled identity, and the other half with their student identity. The study found that priming students with their student related identity rather than their disability related identity led to more autonomy-related thoughts, which means they were less likely to seek help. Although the situation in the study is not fully generalizable to our work, it does provide some insight into the workings of more stigmatized groups that have stereotypes of dependency associated with them. It is possible that being a part of the community circles, which discussed themes including poverty, long hours, and undernutrition, primed the participants to think about their own helplessness, which in turn led to decreased autonomy and a greater desire to be helped, rather than to help themselves. Help is not neutral. According to Halabi and Nadler (2010), it cannot be viewed stripped of the power dynamics that are at play. They theorize that autonomy-oriented help, which is temporary or partial help that allows the recipient to find their own solution, is distinct from dependency-oriented help, which gives the recipient the full solution to the problem but does not allow them to become self-sufficient. Where status relations are perceived as insecure, illegitimate and changeable, high status groups will generally offer dependency-oriented help in order to maintain their advantage, and low status groups will be unwilling to seek help, although they will be more willing to receive autonomy-oriented help. In status situations perceived as secure, legitimate and unchangeable, low-status group members are far more likely to seek out and receive dependency-oriented help. It is possible that the reason the participants in the community circles asked for dependency-oriented help (“give us clothes and food”) were because they were aware of the sharp differences in hierarchy, and saw it as a something that was both legitimate and unchangeable. They might not have been able to understand the concept of us offering them autonomy-oriented help because it seemed useless given that they saw their situation as unalterable (“we are majboor”). That people were more likely to demand dependency-oriented help when they had received it before could be because this previous help had reinforced their ideas of how secure status differences were. How in such a context is it possible to offer sustainable help to a group that refuses to accept it? Halabi and Nadler (2010) believe that developing trust in these relationships can allow for fewer misunderstandings. For us, this means a continued, respectful and aware engagement with those willing to work with us and a more active role in connecting our research to policies so power hierarchies can be altered. 1. Halabi, S., & Nadler, A. (2010). Receiving help: Consequences for the recipient. In Stürmer, S., & Snyder, M. (Eds.). The psychology of prosocial behavior: Group processes, intergroup relations, and helping. (pp. 121-138). John Wiley & Sons. 2. Wang, K., & Dovidio, J. F. (2011). Disability and autonomy: priming alternative identities. Rehabilitation psychology, 56(2), 123.